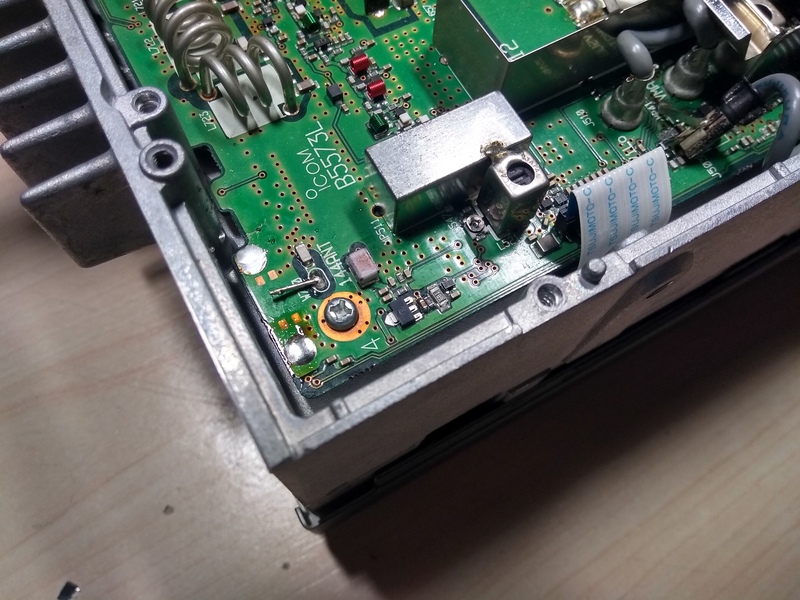 Recently I was asked to take a look at a IC-910h VHF/UHF all-mode transceiver which had developed an issue where the bias kept being enabled. Even on transmit and when the preamp wasn’t enabled. It luckily didn’t cause any havoc as the operator’s antenna wasn’t DC shorted at the time.. If you look at one of my previous posts – you’ll know how a basic bias circuit works (check it out here – SEA remote ATU bias & mods). I’ve traced some lines to show you how things work. Q702 is a PNP transistor – a Rohm 2SB1132 T100R. 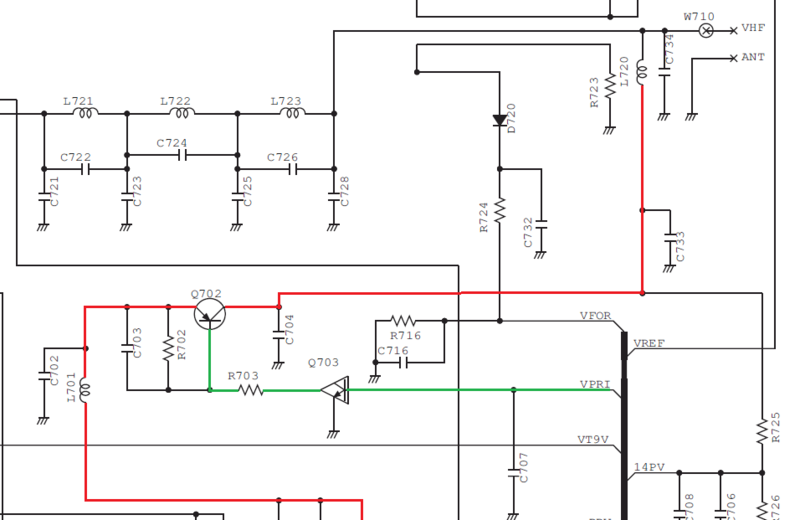 This is the main switching transistor. Rated 500mA. Q703 is a DTC114EUA T106. A bit of a special beast. It’s a “digital transistor”. 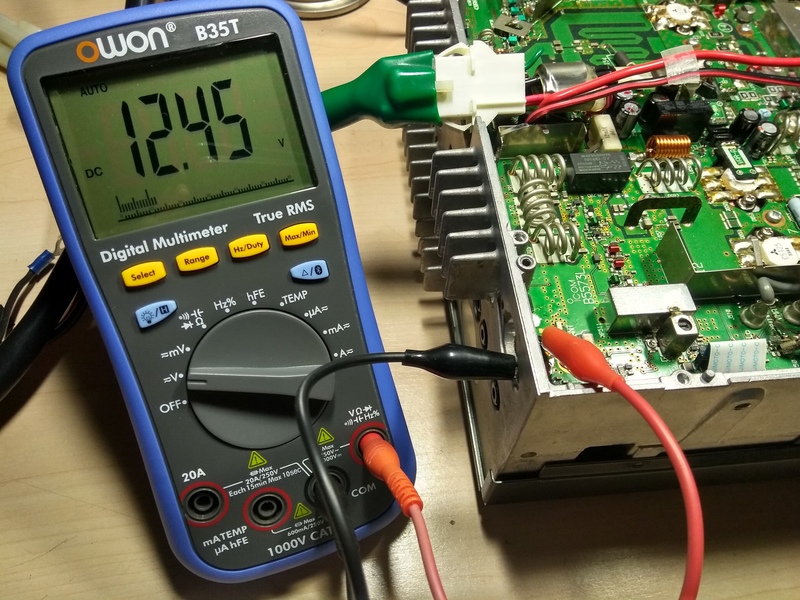 It has built-in bias resistors to enable the configuration of an inverter circuit without connecting external input resistors. So to troubleshoot, I first checked if VPRI was being switched from the main processor with reference to ground. It was. Pfew – no main processor issue. Next step was to check if Q703 actually did any switching: it did as well. Hmm, odd. 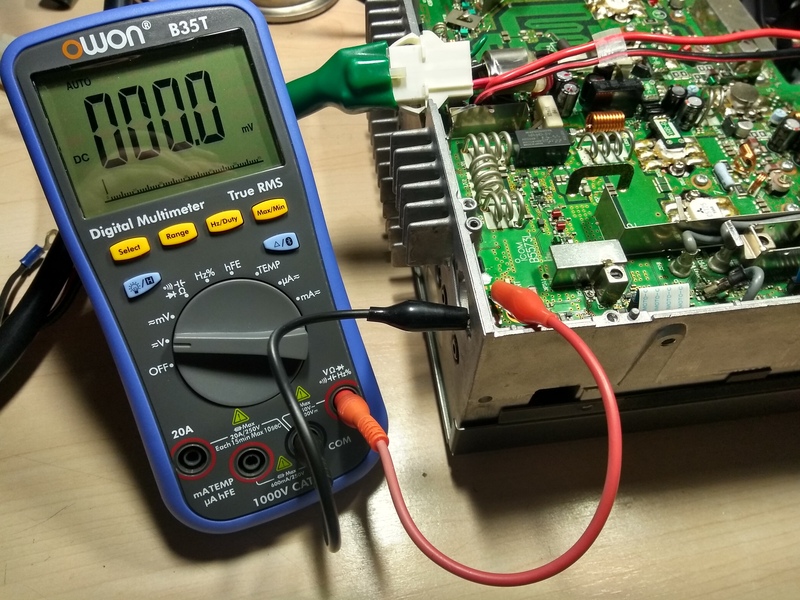 Checked Q702; and it wasn’t shorted when checking in diode test from Base to Collector, or Base to Emitter. Maybe C703 or R702 failed? Nope, not that either. Any tin whiskers around due to lead-free solder? Nope. I still suspect Q702, as for some reason, it conducts, without anything applied to the Base. (Otherwise known as a “Leaky” transistor). To confirm, I replaced it temporarily with a bog standard BC560. Works like a charm. Leaky transistor confirmed. Here’s the testing bodge in all it’s glory. I quickly ordered a couple of Rohm 2SB1132 T100R from https://www.arrow.com/ (I kind of like their fast service and clear website to be honest..). Delivery took a little longer than usual due to the fact that it was in stock in a HK warehouse and I’m in the EU. Remember to really clean up the old pads when working with SMD components. It’s just much nicer. I used Chemtronics fluxed solder wick here. Pads clean up nicely with it. Here’s the new part installed. Looking great. And confirmation it works and can be switched on/off.. 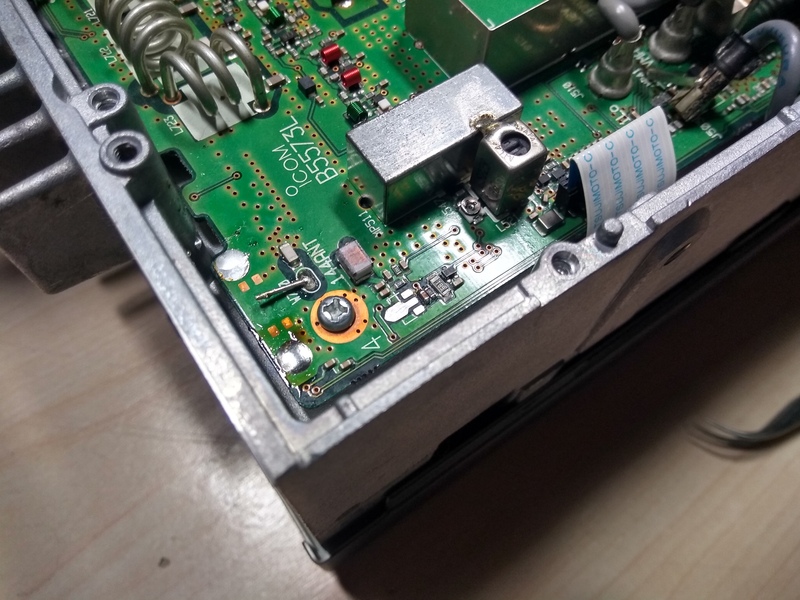 The UHF part is similar; so if you run into issues where bias is kept on with your IC-910h; make sure to take a look at these components. The UHF part is a bit trickier, as you need to disassemble the entire PA unit.. 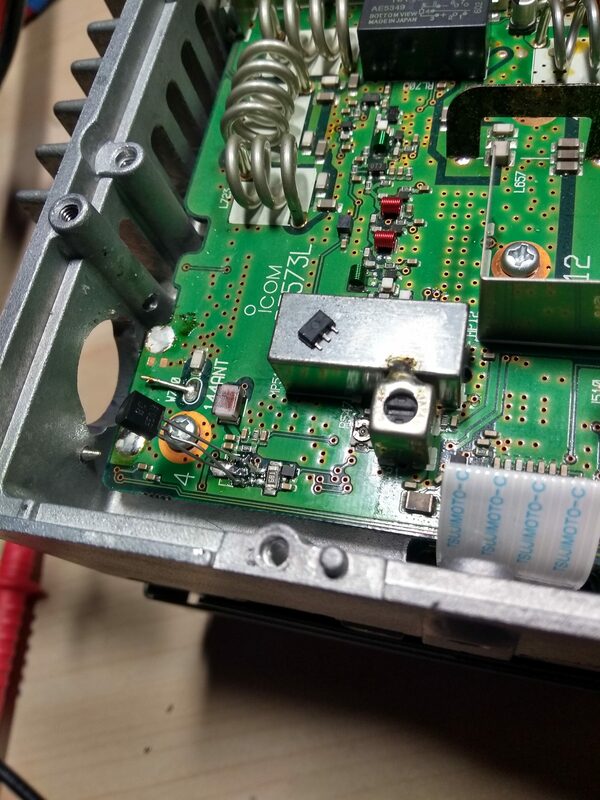 This entry was posted in Electronics, Ham Radio, Repairs by ON8AD. Bookmark the permalink.